Romance is in the air at Angel’s Lair in Pigeon Forge, Tennessee. This studio-style cabin features 1 bedroom, 1 bathroom, and semi-private, wooded views all around. 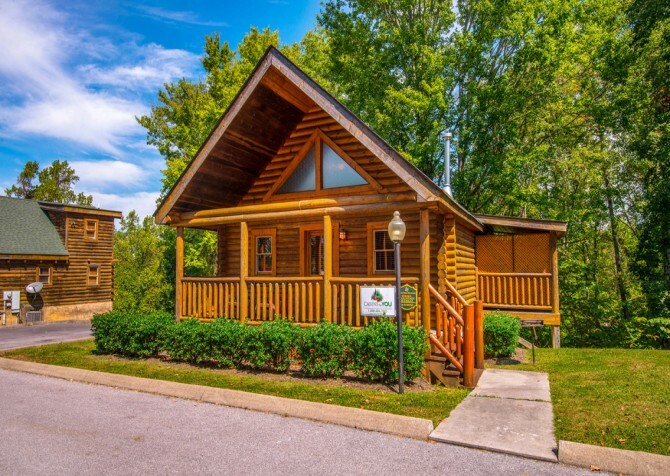 You and your special someone can cozy up in front of the gas fireplace, stretch out on the king-size bed, or enjoy a relaxing soak in the outdoor hot tub or indoor jetted tub that comes with this intimate cabin. But even if you can’t get away from the kids for the weekend, you can still find room for them in Angel’s Lair. This cabin has a separate sleeping space with a full-size bed, providing comfortable accommodations for up to 4 guests. Enjoy easy access to Angel’s Lair with its flat, paved driveway, as well as easy access to the exciting attractions of downtown Pigeon Forge, which is less than 6 miles away. A cozy Smoky Mountain retreat awaits you at the Angel’s Lair! Enjoy bright pops of color as you enter Angel’s Lair that continue into its cozy living space. The living room features a large leather couch, rustic wood furniture, and modern conveniences like a giant flatscreen TV and DVD player. 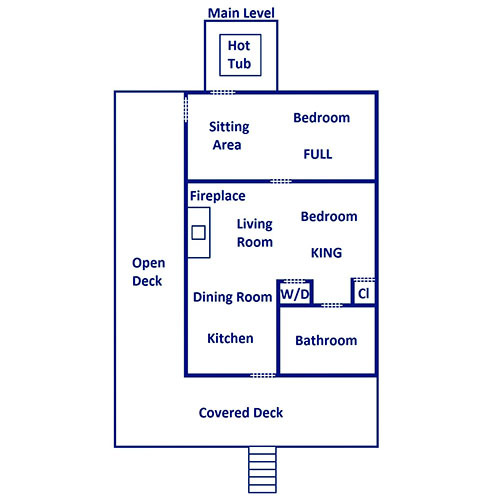 Plan for relaxing nights in the cabin with your favorite TV shows or DVDs while you cuddle on the couch and enjoy each other’s company. The living room of Angel’s Lair also comes with a chest that doubles as a coffee table, where you can set down your drinks or set up your favorite board game. And a feature you’re guaranteed to love is the stone-set gas fireplace in the middle of this room. 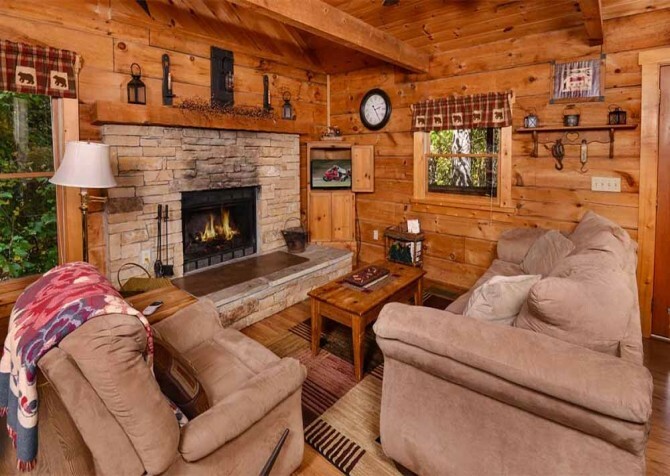 If you’re coming to Pigeon Forge in the fall or winter—two of the most popular seasons to visit the Smokies—you’ll love coming back to a warm cabin with a crackling fire. The kitchen found inside Angel’s Lair is the perfect size for your 2-person getaway. You’ll find all the major appliances you use at home, including a refrigerator, oven, stove, microwave, and dishwasher. There’s even a coffeemaker and toaster, so you can plan to enjoy a quiet breakfast for just the 2 of you instead of hurrying into the hustle and bustle of downtown. This kitchen also comes with a granite counter that doubles as a prep station and breakfast bar, complete with 2 stools. Finally, enjoy a garden window that provides a quaint view of the woods while you cook, sip coffee, or stir a pot of warm soup on the stove. Between the kitchen and living room in this open-concept cabin, you’ll find an intimate dining table set for 2. While downtown Pigeon Forge has a number of delicious restaurants you should try, there’s also something special about a cozy dinner in the cabin for just the 2 of you. If you don’t feel like cooking, try our catering option instead. We have an in-cabin chef who will prepare and serve a delicious meal inside Angel’s Lair without you having to lift a finger. We also have special gift packages like a romantic dinner for 2 delivered to your cabin door. You’ll receive steaks, potatoes, a tossed salad, dessert, sparkling cider, and more—everything you need for a quiet night in the cabin with the one you love. Angel’s Lair is a studio-style cabin with the main bedroom—featuring a king-size bed, double end tables and reading lamps, rustic log furniture, and modern bedding—staying open to the main living spaces. The design of the cabin makes for an intimate space that can be enjoyed by honeymooners, golden year couples, and everyone in between. Adjacent to this bedroom is the large bathroom found in Angel’s Lair. Enjoy its indoor jetted tub during your romantic Pigeon Forge getaway—the perfect way to soak away all the stress of home and enjoy your time together. French doors will lead you to a separate sleeping space found in Angel’s Lair. If you’re bringing kids with you, this bedroom features a full-size bed where they can sleep in privacy. There’s also a small game table for checkers or cards in this space, a reading lamp and end table, and a small reading area with a bench and radio. The semi-private, wooded atmosphere of Angel’s Lair is truly one of its best features. If you’re looking for a quiet, secluded getaway where you can enjoy spending time with the one you love, this cabin is a great fit for you. Walking up to the cabin, you’ll notice red rocking chairs on the front porch where you can sit at the end of the day, sharing memories from your Pigeon Forge experiences and sipping wine from your favorite Smoky Mountain winery. There’s also a charcoal grill on the front porch so you can plan for a special steak night or a simple family dinner of hamburgers and hot dogs. When it’s time to chow down on the delicious food you’ve prepared, head to the outdoor dining space that comes with Angel’s Lair. This cozy area features a table with 4 chairs, where you can listen to the sounds of the Smokies and enjoy a private meal together you’ll always remember. 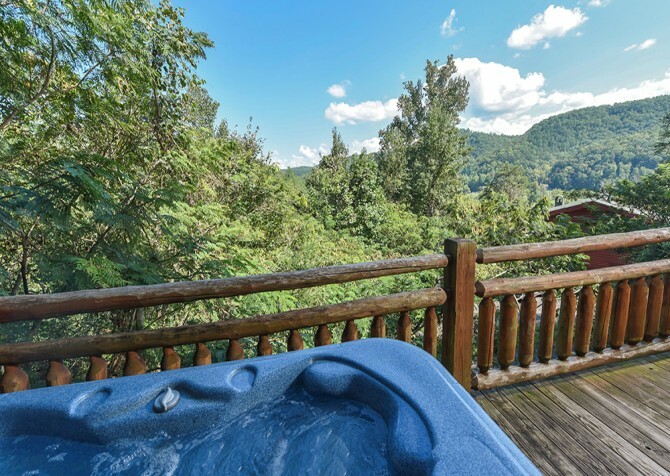 And best of all, Angel’s Lair offers you a covered outdoor hot tub with views of the Smoky Mountain trees all around. Be sure to take advantage of all the ways to relax and have a fun time in the great outdoors during your stay at Angel’s Lair. Angel’s Lair is a cabin that aims to please with a list of amenities perfect for your romantic retreat. Besides an indoor jetted tub, flatscreen TV, outdoor hot tub, and king-size bed, this cabin also comes with a few other features we think you’ll enjoy. A DVD player is the perfect addition to the giant flatscreen in the living room. You can bring your own DVDs, rent a new release at Redbox, or even take advantage of the movies offered inside the cabin at Angel’s Lair. 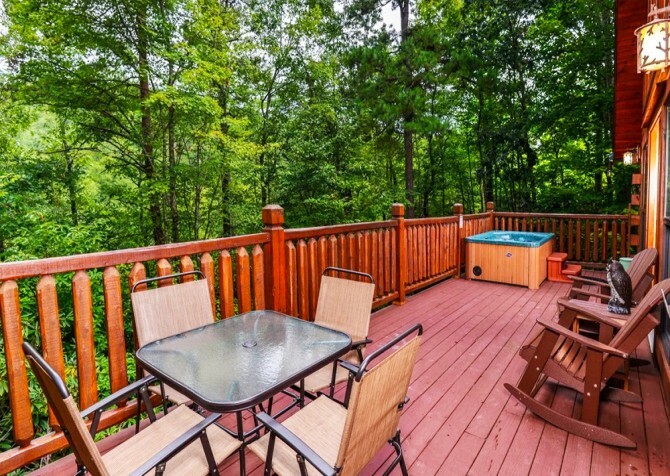 This Pigeon Forge cabin also comes with free Wi-Fi access, so you don’t have to use all your data while you’re away. We recommend using Wi-Fi to keep up with our Cabins For You blog while you’re away. Let us do all the work when it comes to upcoming events and popular attractions so you can have all the fun! Finally, Angel’s Lair comes with a washer and dryer that are available for you to use during your stay. If you’re planning a trip to Dollywood’s Splash Country or the Great Smoky Mountains National Park, you’ll be glad to have a way to clean your clothes before it's time to repack your suitcase. The Comedy Barn Theater in Pigeon Forge is perfect for a fun night out with that special someone. Plan for big laughs and delicious food at the show that’s been declared “Pigeon Forge’s funniest show for over a decade”! If you’re over 21, we invite you to visit this popular micro-brewery and restaurant. Smoky Mountain Brewery has everything from all-natural beers to pizza, burgers, and sandwiches. Home of the Great Smoky Mountain Wheel, The Island is a great place to spend the day when you’re in town. With a variety of shops, restaurants, and rides, this attraction provides non-stop entertainment for guests of all ages. "We stayed at Angle's Lair for our honeymoon. The cabin far exceeded our expectations! It was absolutely BEAUTIFUL! The staff was very nice and polite both times we called with questions. The cabin was very clean, and have I mentioned how beautiful it was? This is the perfect getaway for any couple looking for a romantic weekend. We will definitely be back!" "We loved our stay. The cabin was great. It was very clean and cozy. We will definitely stay there again." "We stayed in Angels Lair for our honeymoon and it was absolutely perfect. I loved every second of it. And this company has been wonderful. Check in and out was a breeze."